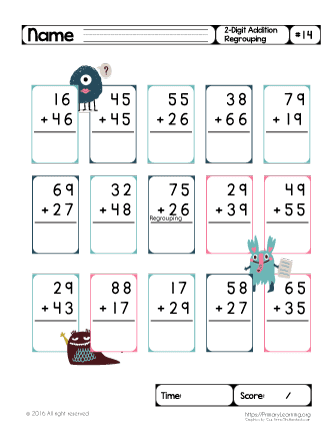 This worksheet help kids build math fluency. Get your second-grader solve problems and look around for monsters. Addition can be confusing for your second grader. This addition worksheet will help her to build math fluency. Is your kid struggling with addition? 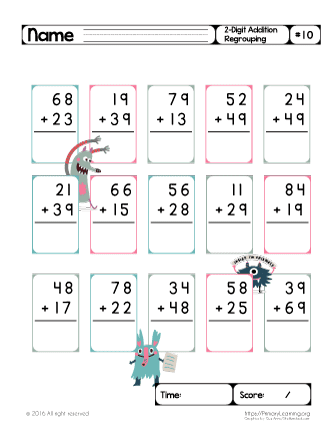 Our worksheet will help your child solve two-digit addition using vertical strategy. Looking to make addition even more interesting for your students? 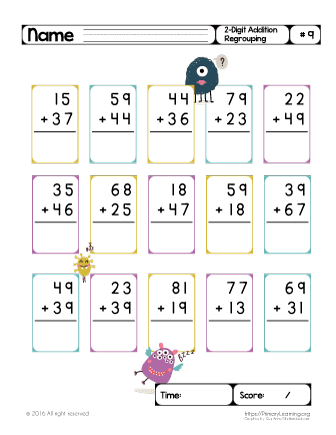 Check out this two-digit addition worksheet. 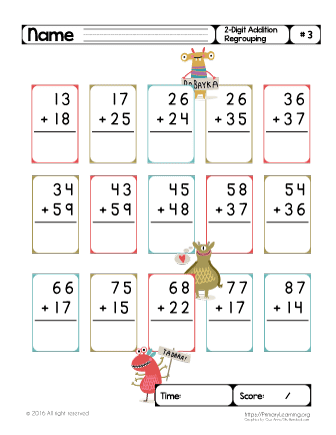 With this cute worksheet, your students will find regrouping with addition problems and math will not be bored anymore! Fifteen addition problems to work on for your students. Check the adorable addition worksheets with regrouping. 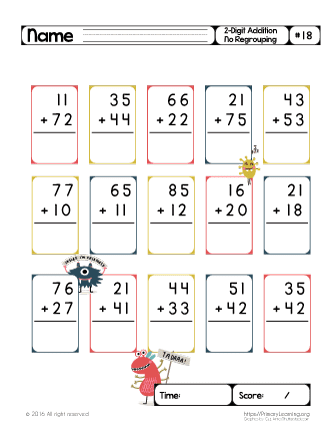 This second-grade worksheet will help students to build their confidence with two-digit addition. Monster fun! 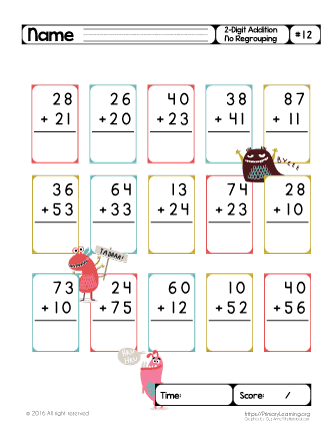 Looking for practicing two-digit addition that will not be boring for your child? 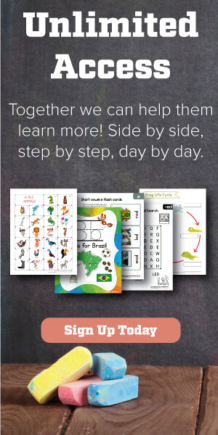 Check this add with regrouping worksheet. Looking for more engaging addition practice? 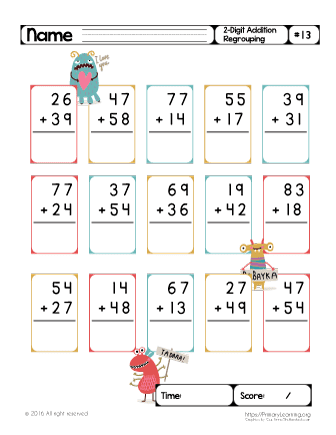 Check this 2 digit regrouping addition worksheets with cute monsters. This worksheet helps children develop math fluency. 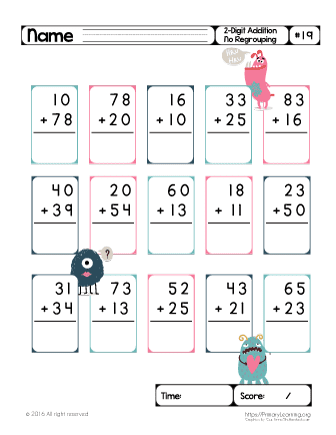 Solve bunch of addition problems and look around for monsters. Understanding addition with regrouping is an essential skill that helps build the grounds for advanced math concepts. This worksheet will help your students master their math skills and solve addition problems using vertical strategy. Looking to make addition practice fun and engaging for students? This adorable worksheet is all your student need. Is your child bored of solving lots of problems? Not anymore! 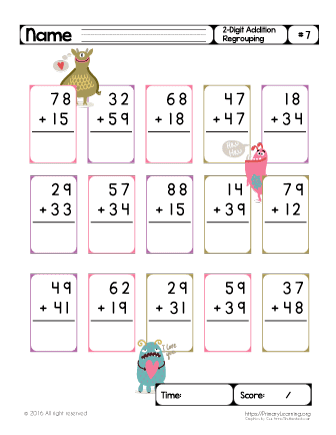 Practicing 2 addition regrouping with cute monsters. 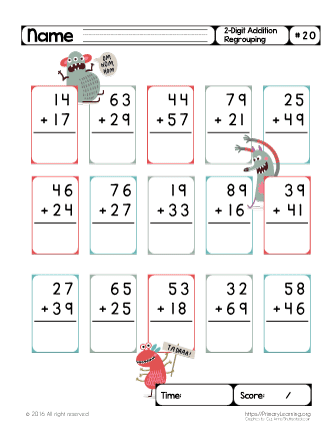 Help your child sharpen her math skills with this double-digit addition regrouping worksheet with cute monsters. 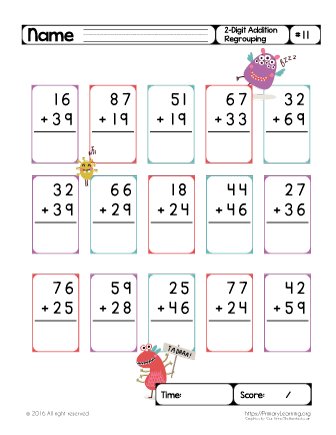 Practicing math skills with our two digit addition regrouping worksheet will not be bored for your second-grader. 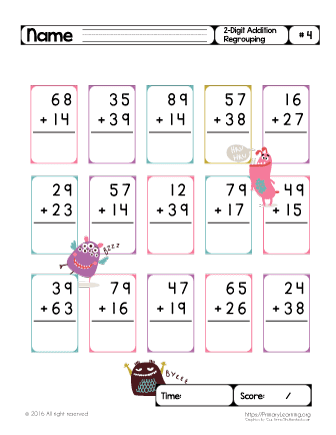 Double digit addition scared your child? 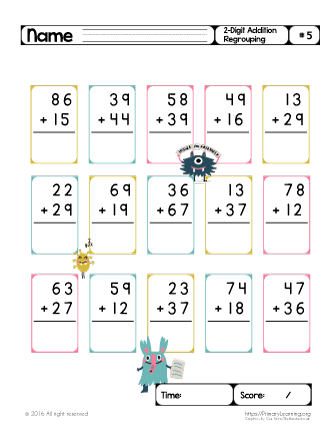 Check this sheet with regrouping series and practice with cute monsters. 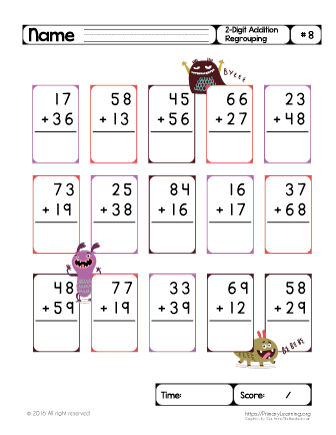 Practice two-digit addition with regrouping help second-graders build their math fluency and make practice fun. 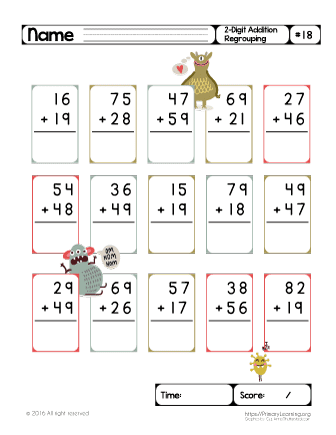 Looking for 2 digit addition with regrouping worksheets that not only educate but will also engage your child? 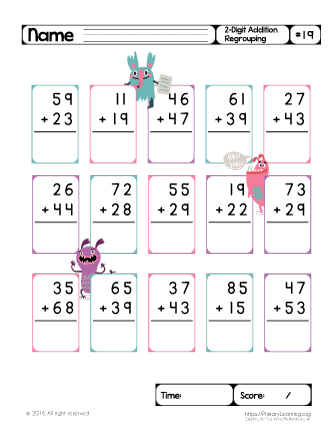 Practice perfect math addition with regrouping and improve math fluency skills. 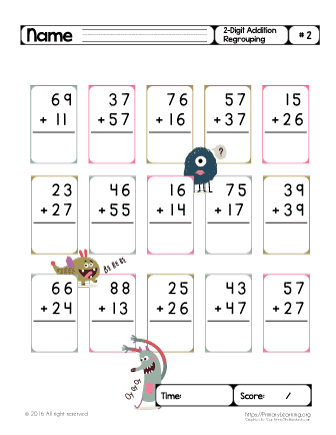 Solve a bunch of problems with monsters. 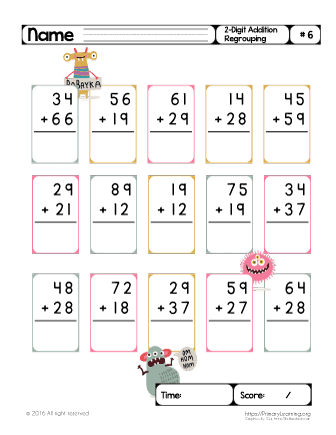 Our collection of two-digit addition without regrouping worksheets is great for practicing fundamental math skills. Looking to boost your second grader addition skills? 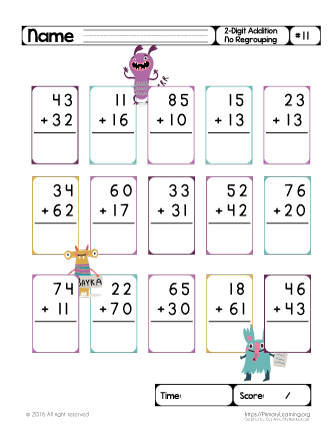 Check out this incredible double addition worksheet with monsters. 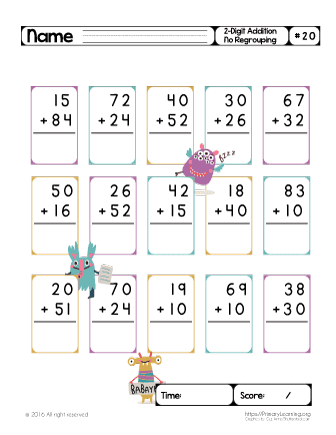 Addition worksheets without regrouping with cute monsters are great for mastering your child's fundamental math skills. 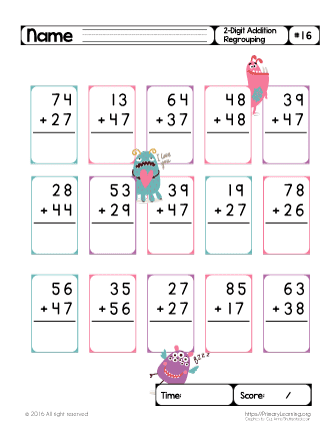 Your child will enjoy practicing addition without regrouping with these cute monsters. 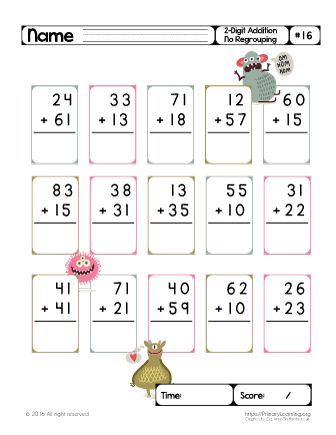 Math practice is fun! 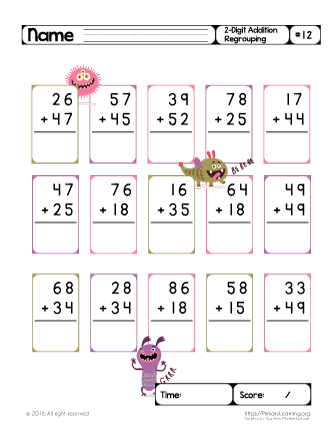 Bring a fun into your classroom and let student solve 2 digit addition no regrouping problems with cute monsters. Practice, practice, practice! 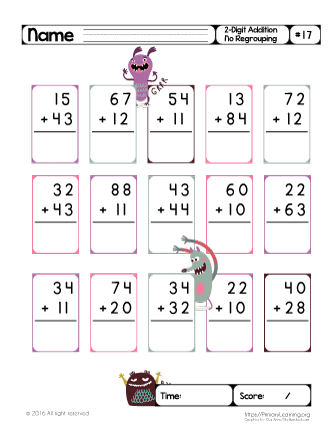 Kids will love to practice 2digit addition problems with these little monsters. 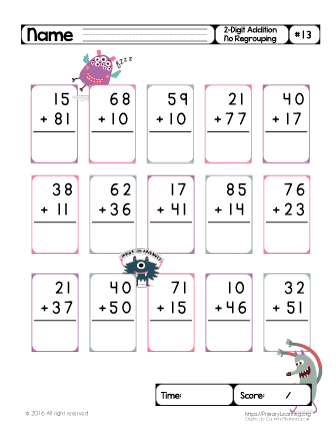 Challenge your second grader to complete the page with 2digit addition no regrouping worksheet full of cute monsters. 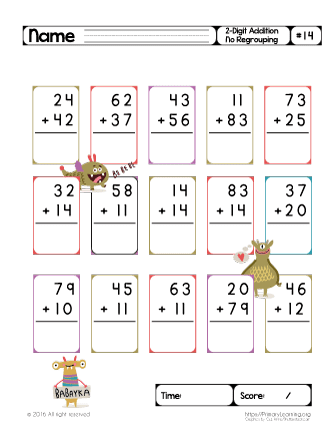 Practice perfect math skills with colorful double digit addition without regrouping worksheets.Great for second graders. 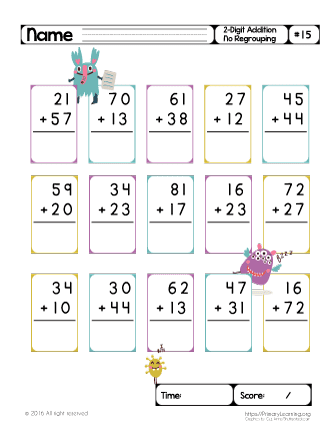 This Two digit addition worksheet is a great way to boost this skills and turn math practice into a fun learning time. Looking for math? Practice addition of double digit numbers without regrouping with this great worksheet.